1. Preheat the oven to 190°C, gas mark 5. Use 5g butter to grease a medium-sized baking dish. Add the chicory, cut-side up, and spread the remaining 10g butter over the cut sides. Combine the crème fraîche, honey and mustard in a bowl with 1 tbsp water and season. 2. Spoon over the chicory and cover with foil. Bake for 30 minutes, remove the foil and cook for 5-10 minutes more, until bubbling. 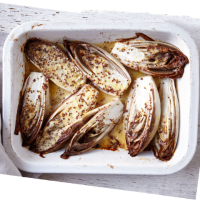 The crème fraîche will be greatly reduced and the chicory browned at the edges.